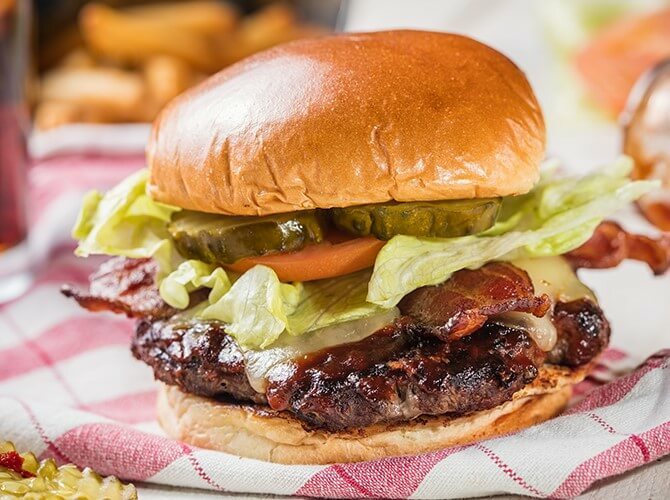 This American classic restaurant has six burger options to choose from: Whisky Bacon, Brunch, American Standard, Triple Bacon, Classic, and their Quesadilla Burger which features all your favorite burger and quesadilla fixings melded together. At Axel’s, you may be limited to one burger choice, but we don’t think you’ll be disappointed in it. 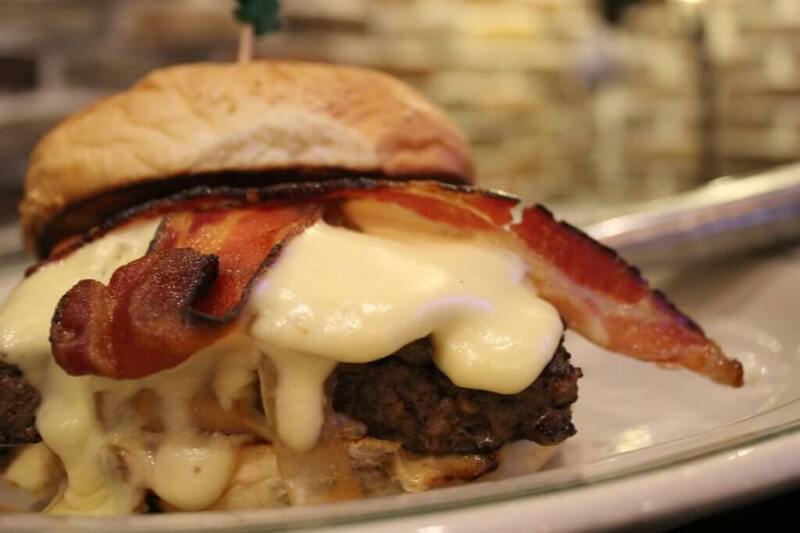 Their Bourbon Burger is made with a sweet and spicy rub, brie cheese, bourbon onions, and bacon with dijonnaise. If you visit during lunch hours, you also have the option of a Steak Burger. 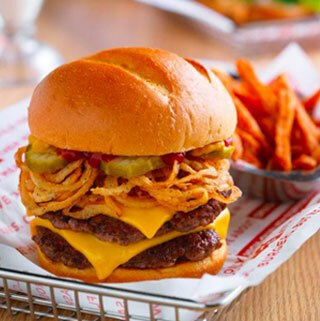 Baker’s Square has it all, and they’re serving up four burger options: Reuben, The Works, Shaved Sausage Burger, or an All-American Crush Cheeseburger. Substitute a BOCA® veggie burger or grilled chicken breast in place of any of their ground beef patties. Of course when you think of Buffalo Wild Wings, you think of wings first. But their burgers could give their wings a run for their money! 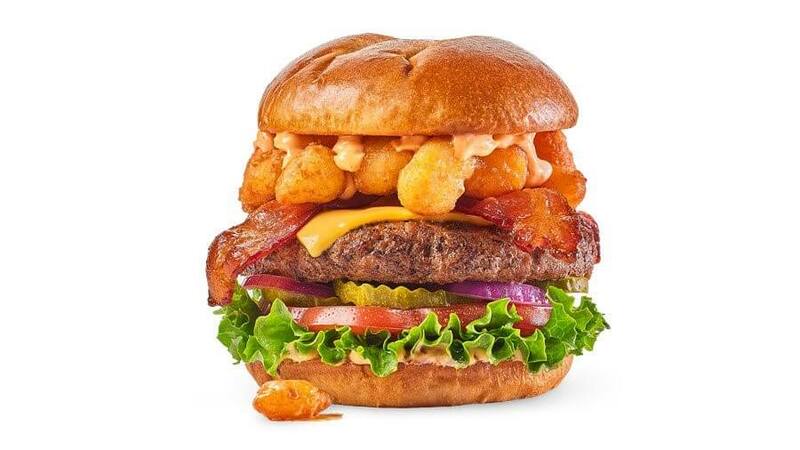 We love the variety here: Cheeseburger, Big Jack Daddy, Screamin’ Nacho, Buffalo Blue, Boston Lager, Southwestern Black Bean Burger, and definitely try the fan-fave Cheese Curd Bacon! 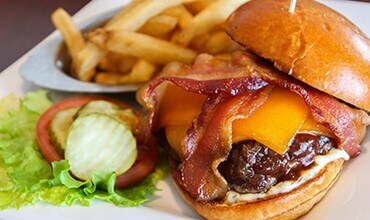 You’ll only find burgers at Chianti during their lunch hours (Monday-Saturday until 4 PM). Choose from a Bacon Cheddar Burger or a Mushroom & Fontina Burger that is topped with balsamic sautéed portabellas and buttermilk-fried leeks! 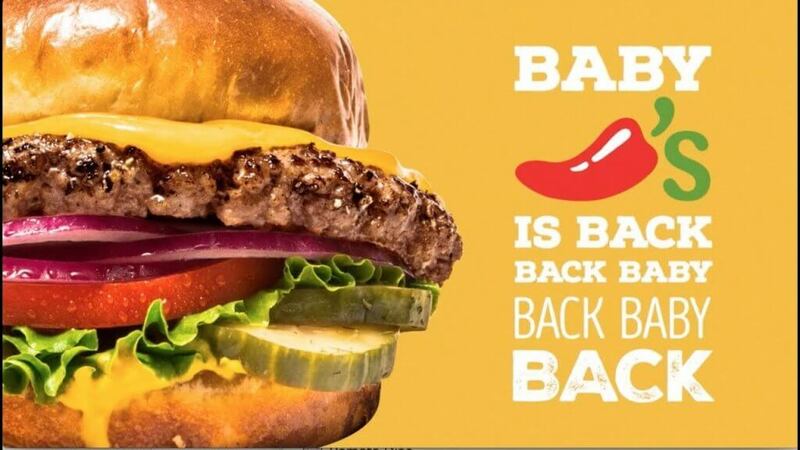 In case you haven’t heard, Chili’s is back (baby back, baby back), and their Big Mouth Burgers are better than ever! With eleven options, this place will satisfy all burger tastes. Choose from: The Boss (topped with smoked brisket and rib meat), Alex’s Santa Fe, Chili Burger, Ultimate Bacon, Sunrise, Southern Smokehouse, Big Mouth Bites, Guacamole, Classic Bacon, Oldtimer, and Oldtimer w/Cheese. If beef isn’t your burger style, CRAVE might be the place for you. 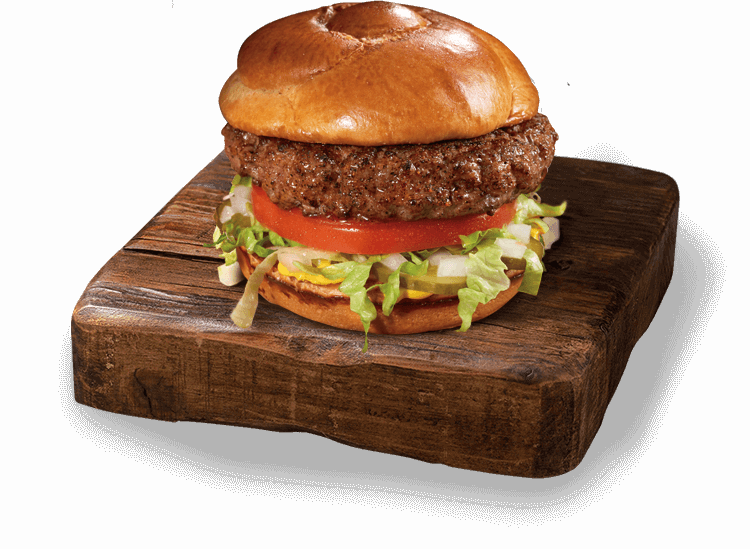 Their CRAVE Burger is certified Angus Beef, or you can choose from a Bison or Mediterranean Lamb Burger. 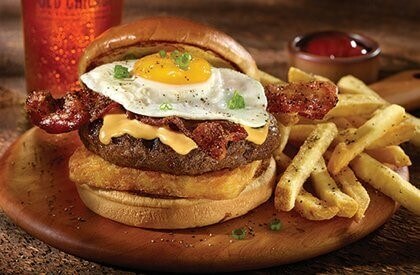 Denny’s is almost synonymous with breakfast, but they boast quite the burger menu, as well. Build your own or enjoy their Bacon Gouda, Spicy Sriracha, Double Cheeseburger, Bacon Avocado Cheeseburger, Bourbon Bacon, or Slamburger. Famous Dave’s Legendary Burgers are delicious on their own, but when you top them with their Texas Beef Brisket (add $1.99), you’ll take their Classic Cheeseburger, Jacked-N-Stacked, Ultimate, Dave’s Favorite, or Devil’s Spit Burger to the next level. If you’re looking for natural, look no further than Good Earth. Their Basic and Good Earth® Burgers are made with grass-fed beef. They also offer grass-fed bison burgers and house-made vegetarian burgers made from adzuki and pinto beans, sunflower and sesame seeds, cashews, and vegetables. All are served on a whole wheat bun and topped with lettuce, tomato, and pickle slices. Various add-ons are also available. Granite City’s steakburgers are half-pounders that are full of flavor! 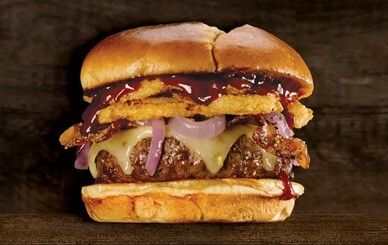 Traditional options like Bedda Chedda (with bacon) and Classic Cheeseburger are available, as are Maple Pepper Bacon, Bleu Peppercorn, Triple Blend Cheeseburger, Bison Burger, and the “Big Show,” which is topped with Double IPA-braised pork, BBQ sauce, Cheddar, and crispy onion strings and served on a pretzel bun. Freshly ground, never frozen, all-natural U.S.D.A. Choice Angus beef from local farms in Southwestern Minnesota and Northwestern Iowa is what you’ll get at Green Mill. If you’re feeling extra hungry, the Big Mill has two patties! Otherwise their Roasted Chili Pepper, Western Mill, Avocado Ranch, and Four-Cheese Bacon Burgers are all excellent choices. Grumpy’s Big Burgers are Twin Cities classics for a reason. All of their beef is sourced from local farms, ground fresh, and never frozen! Sure, they’ve got the standards (The American, Juicy Lucy, Build Yer Own, Guacamole, Slow Burn), but they also have some of the most inventive in the area. The NY is topped with pastrami; the Cream Cheese is topped with cream cheese blended with chives and chopped bacon; the Garlic Cheesy replaces the bun with cheesy garlic bread and marinara; and the Southern Style “The Elvis” is topped with peanut butter and bacon. Veggie patties available. Of course the local sports bar has a wide selection of burgers. If one of their thirteen burgers (ten beef, two turkey, and one black bean veggie) can’t satisfy you, there might be no hope! Their beef is also locally sourced and never frozen. You’ll find all your favorites such as Cheeseburger, Bacon Cheeseburger, Bourbon Street, Roadhouse, Black and Bleu, French Onion Melt, and Sunshine, along with new concoctions such as the galicy MVP, peanut buttery Blue Suede Shoes, spicy Insanity Burger, and chipotle Harvest Turkey Burger. Key’s burgers are made with certified Hereford Beef. They mostly do the classics — think Plain Hamburger, Cheeseburger, Bacon Cheddar, Mushroom Swiss, California, Hen-Burger (topped with an egg), and Deluxe (with all the fixings) Burgers — but be sure to check out their Golden Apple Burger. It’s an Italian sausage or beef patty with Cheddar, bacon and apples served on a grilled caramel roll! We understand why your first instinct wouldn’t be to order a burger at this Mexican restaurant, but if you’re ever there and suddenly realize you need a burger, they have you covered. 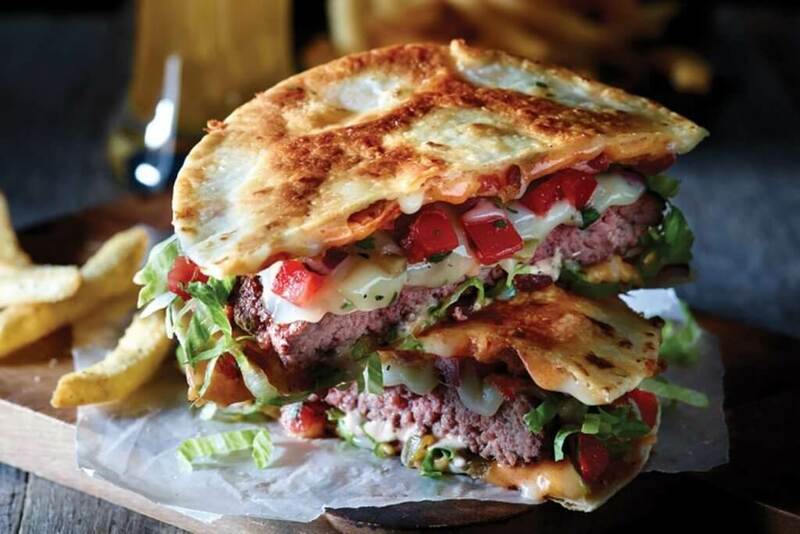 Their half-pound Fiesta Burger is topped with pepper jack cheese, lettuce, tomatoes and chipotle ranch dressing. What better place to enjoy a burger than at a pub? They offer 20 varieties. For these, choose from a basic Burger, Patty Melt, Balsamic Blue, Lucky 13, Hickory, Brie & Bacon, Inferno, Mushroom Swiss, Sweet Heat, Guac, Classic, Black and Bleu, Drunk and Dirty, Sunrise, or Cheese Curd Burger. They also offer stuffed burgers: Juicy Lulu, Stuffed Bleu, and Jalapeno Popper. Lastly they offer specialty Veggie, Turkey Feta, Bison, and California Turkey Burgers. All except the stuffed are available as a bison (add $3) or turkey patty in place of beef. You’re sure to love the sausages at this wurst + bierhaus, but their hand-crafted burgers are nothing to scoff at! 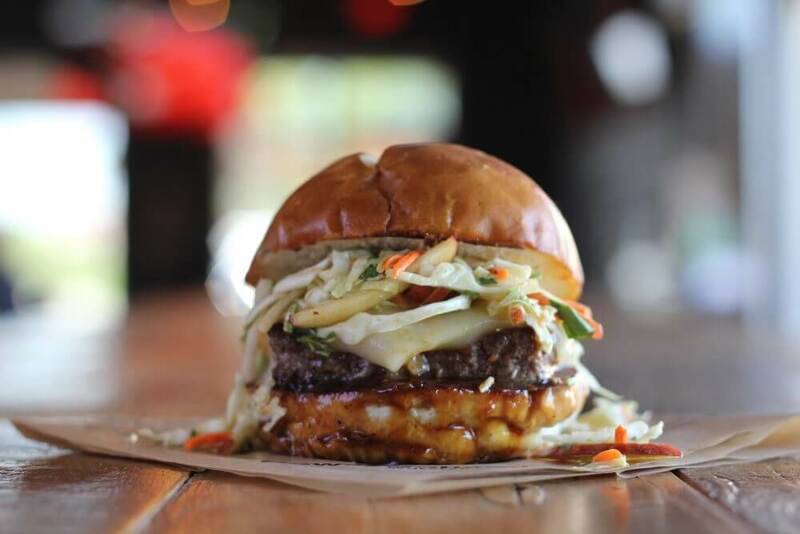 Try a Reuben Burger, Classic Cheeseburger, or Korean Burger which is topped with Asian slaw and Munster cheese. Another tasty Mexican joint that will serve up a burger for you. Their half-pound fajita burger is topped with sautéed onions and peppers, sour cream, and guacamole. You also have the option to build your own burger. 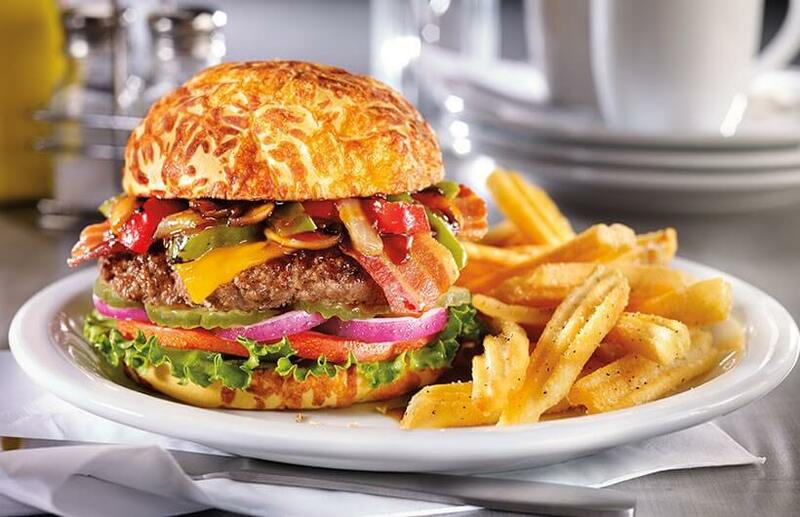 Old Chicago’s got you covered when it comes to not only pizza, but burgers too. 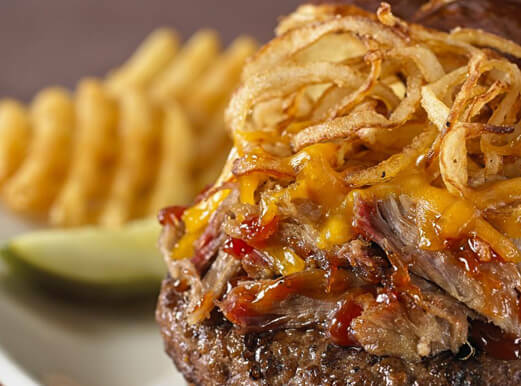 Traditionalists will love the Classic Cheddar, BBQ Bacon Cheddar, and Crafted Beer Burger (featuring Guinness beer cheese sauce and crispy onion strings). Those on the more adventurous side will appreciate the Hangover (served atop hashbrowns with an egg and bacon), Hawaiian (teriyaki-basted with Canadian bacon and roasted pineapple), Whiskey Bleu (bleu cheese sauce, peppered bacon, balsamic mushrooms, and whiskey sauce), and Swiss Veggie Burger (veggie patty made with whole grains). This is the perfect lunch option, as they’re only open until 3 PM (and closed on the weekends). You can get a classic Hamburger or Cheeseburger topped with lettuce, tomato, and onion. Don’t get too overwhelmed choosing between their eighteen options! They helpfully split them up to categories for you. Classic burgers: Hamburger, Cheeseburger, Bacon Cheeseburger, California Cheeseburger, Mushroom Cheeseburger, and Chili Cheeseburger. 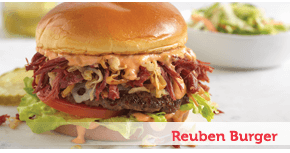 Specialty Burgers: The Loaded, Plaza, Hot Bacon Bleu, Southwestern, PB&B, Patty Melt, Bavarian, Hawaiian, and Reuben. Skinny Burgers: Turkey, Bison, or Veggie all served on a wheat bun. Did you know you can get non-breakfast food at the Original Pancake House? Their lunch menu is actually quite extensive and includes Hamburgers (cheese and bacon available) and turkey burgers. If you’re at this steakhouse and not in the steak mood, they have three burgers to choose from: The Outbacker is topped with the classic fixings, Grass-Fed Burger with Aged Cheddar, and the Bloomin’ Burger topped with spicy bloom sauce and blooming onion petals. Perkins is not just for breakfast food! Try their Frisco Burger, A1® BBQ Bacon Burger, Sweet N Spicy Sriracha Burger, Patty Melt Pile On, Breakfast Burger, or Classic Cheeseburger. You know a place that specializes in burgers is bound to be good. You can’t go wrong with their Signature Burgers — Triple Double; Classic Smash; Bacon Avocado Club; BBQ, Bacon & Cheddar; Buffalo & Blue Cheese; Spicy Jalapeno Baja; Spinach, Cucumber & Goat Cheese; and Truffle Mushroom Swiss — or craft your own with beef, chicken, turkey, or black bean patties, and multiple bun, cheese, topping and sauce options. Whew! That’s a lot of burger options in Roseville! How many have you tried and which is your favorite? Let us know in the comments or on social media. You can find us at VisitRoseville on Facebook and Twitter and VisitRosevilleMN on Instagram.